From a simple blogging platform, WordPress has evolved into a powerful CMS tool that people are using in their own unique ways. Previously, we showed you how to do collaborative editing in WordPress. 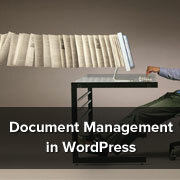 In this article we will show you how to use WordPress as a document management system. The goal is to use WordPress as a collaboration platform, allowing teams to work on documents at the same time and handling file management, workflow, and file hosting. First thing you need to do is to install and activate WP Document Revisions plugin. 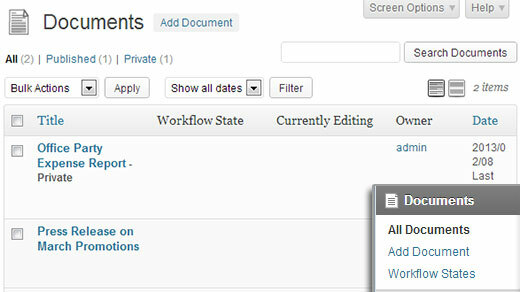 Once activaed, the plugin will add a “Documents” menu item in your WordPress admin sidebar. Clicking on it will take you to Documents page. To add a new document click on “Add Document”. This will take you to Add New Document page where you can give this document a title and upload it to WordPress. You can also choose a workflow state from the Workflow State drop down menu. By default you have initial draft, in progress, final and under review states. You can assign the ownership of the document to any other user in your WordPress. The default publish status of a new document is “Privately Published”, which means that the document is available for other users in your system. You can also make a document password protected or make it publicly available on the front end of your website. WP Document Revisions allows users to check out a document. The document management system locks down a document that has been checked out. If another user tries to edit the same document they will see a notification that another user is currently working on the document, and they have locked it. However, if the second user has the privileges they can override the lock. 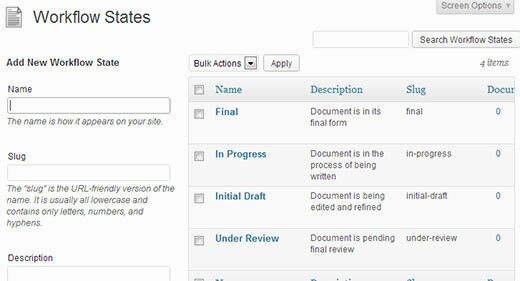 WP Document Revisions take advantage of your existing WordPress user management. The capabilities of users in the document management system are similar to the capabilities of users in WordPress as a blog. Contributors can create new documents, but they cant upload documents. Contributors can also download published documents. However, they can not view privately published documents created by other users. Authors can create and upload new documents. They can also download publicly published documents and edit their own documents. Editors can work on all documents, delete documents and manage workflow. They can not add new users to the system. Administrators can perform all tasks and they can also add new users to the document maanagement system. By default you have Initial Draft, in progress, final and under review workflow states. Go to Documents » Workflow States to create new workflow states or edit the existing states. WP document revisions also works well with Edit Flow. WordPress as the platform and WP Document Revisions as your document management system provides an open source alternative to costly collaboration tools. Let us now what you think about using WordPress as a document management system? What about batch uploads? What if you have dozens if not hundreds documents to upload? I have multiple files to migrate from a third party cloud. I want to have my documents available through my website but don’t want to spend more time than necessary. So, I’m also wondering about being able to bulk upload. it was an awesome post and it became very useful for me . it stated about how to use wordpress for document management software , after trying that i had a positive response and it became useful for me and my company . I think this plugin will work for me. But stull have questions. I want to use the plug-in to display a list of our club minutes on a secure page. The documents will be uploaded by the secretary in their final state. So there will be no revisions. I just need to be able to add a slug to a page that provides a list of the documents and a user can then click and download the document to read. 1. When uploading a document can I state the category of the document and then only display the list of documents in that category on a wordpress page? 2. Where does the plug-in produce the slug or how to I care a slug. 3. Can documents be set to defult as a final state? 4. If someone downloads a final state document does it still lock out other users from downloading the same document. Thank you so much for your time and plugin. Please contact plugin support they will be able to guide you better. who can review the documents , ? 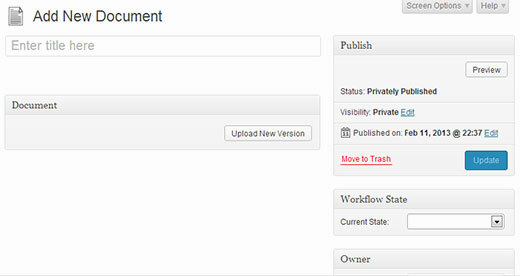 If you want a more powerful plugin for document management in wordpress, look up SP Client Document Manager. It has a lot more control over who can see different files (permissions) and a ton of other features as well. Hi there, thanks for this good article. Is there a way to make the document status ‘Public’ by default? Thanks in advance! I have just installed WP Document Revisions and have loaded up some documents that are for public consumption. I can link to these documents individually within posts and pages, but I want to have one page on my site that will show all published documents without having to add the links manually. Is there the functionality to do this? I thought I would be able to just add the Documents header to the menu bar to do this, but it doesn’t seem to work this way. I would like just one menu button that takes users straight to this page so they can see all published documents without having to run all over the site trying to find them. Just use the shortcut [documents] into a new page and check how it looks. For further customization, you wil need to add some code. How would you use this plugin? Who can benefit from this plugin? I installed this… How come I can upload *.doc and *.docx? I imagine there are more since these are the first two I’ve attempted. Thanks for the lesson on setting up a document system!